If you’re in the market for a documentary about an iconic woman, you’re in luck! This month TWO such films are coming to theaters. 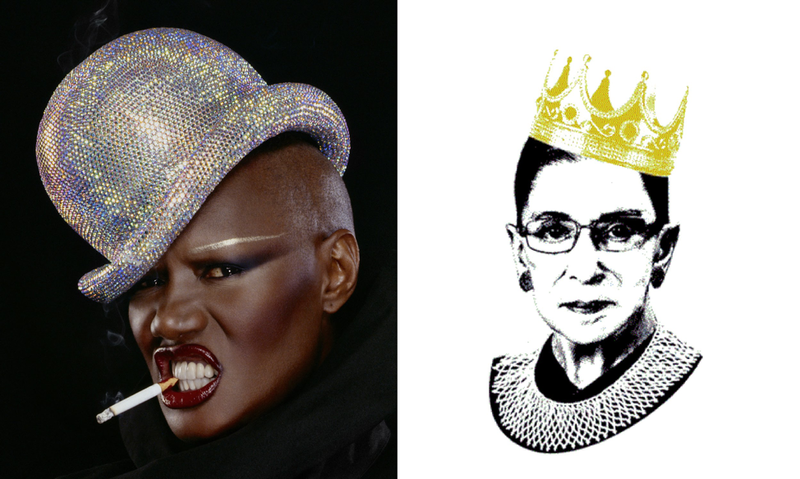 Grace Jones: Bloodlight and Bami and RBG will be in the Philadelphia area this week and next week, respectively. Each is more of a personal look at the woman. Rather than focusing on their career, they show the delicate balance and interplay between personal and professional life. Bloodlight and Bami (directed by Sophie Fiennes) follows Grace Jones on some recent travels including the US and Paris but mostly focusing on her return home to Jamaica. There, she reminisces with family and old neighbors about her formative years and growing up under her father’s strict religious rules while she works on her new album. While there isn’t much of a narrative line to the film, it does give a very interesting look into the life and (maybe?) psyche of Jones. Her conversations are intercut with live performances of songs that were selected to underscore whatever story Grace was just telling. At times, the story explains the song and others it’s the other way around. While the film is not your typical biography/documentary, it doesn’t really do anything too mind-blowing either. But honestly, why bother? It would only end up trying to compete for attention with Grace Jones. What more do we need? For example, the first live performance shows Jones singing while hula-hooping. This a nearly unimaginable feat for anyone, let alone a hard-partying performer that will be turning 70 later this month. Throughout, Jones is seen going between lavish hotels and the simple homes of friends and family. She cooks her own fried fish at her family’s home in one scene but is served a champagne breakfast in her luxury room in another. She seems comfortable anywhere, but we also get the sense that it has taken her these 70 years to get that way. RBG (directed by Julie Cohen and Betsy West) assumes (like Bami) that we are familiar with the work of the film’s star. Unlike Bami, this is a VERY typical biography/documentary. Again, the film is lucky in that it has such a great personality as a subject. There’s not much special about the presentation of the subject, only the subject herself. Even then, there are no deep insights from Ginsberg herself. There really aren’t any moments when she pulls back the curtain. Stoic as always, the story of the person behind RBG is told by her longtime friends and family. This story is especially driven by her (now deceased) husband Martin. Silly and outgoing, Martin was the rock that Ginsberg leaned on for support. While it is more and more common now, Martin took a step back from his career in order to let Ruth pursue hers at a time when she wasn’t even accepted into many institutions because of her gender. While Ruth’s life is inspirational on many fronts, I found her relationship with Martin to be the core of this story. It was clear that they loved each other deeply, but were comfortable and confident enough to give the other the space and time they needed to succeed and be happy. While I don’t think this film will change anyone’s mind politically, I do think that it will inspire many viewers to work hard for what they believe in and support those around them who are doing the same. With Jones at 70 and Ginsberg at 85, these films are great examples showing that older women are not to be forgotten and ignored. To this day, each is making a mark on society. Go and witness it for yourself with these films, if for no other reason than they are stories that aren’t told often enough.